Hey guys! Happy Wednesday! Happy day before Thanksgiving day! I can’t wait for #allthefood! Today we are sharing a super cute table you can make for under $40 in lumber and only 8 boards… Heck yes. Sign me up! Before we get started, be sure to check out the YouTube video tutorial HERE or in the link below! 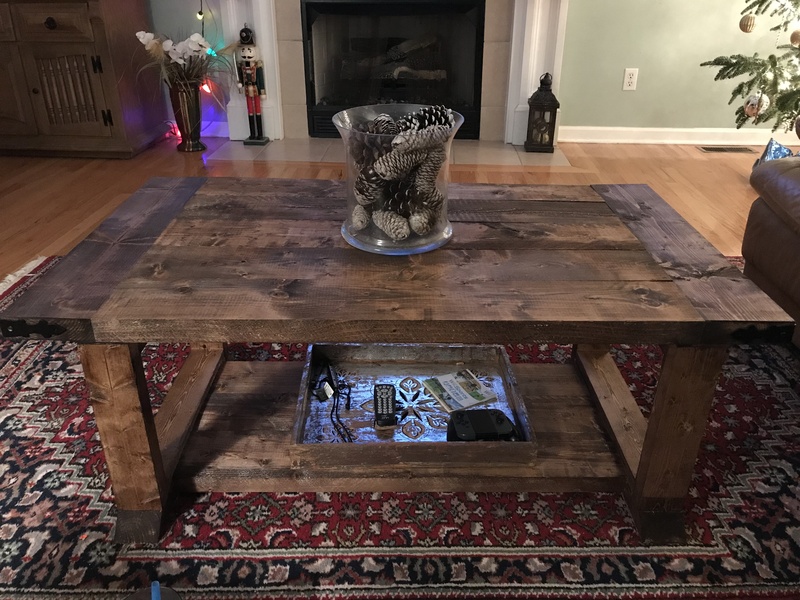 How cute did this Farmhouse Coffee Table turn out?? Now add the decorative pieces to the top and bottom. These edges are cut at a 45˚ angle and are attached to each assebly with wood glue and 2.5” wood screws through each decorative piece and into the leg assembly. We cut the decorative diagonal pieces to fit on this part. Mark each board with your pencil and cut them to fit exact. You can check out the video if you have questions about this part! We walk you through it. Cut the diagonal pieces to fit first, then mark and attach them to each other using wood glue and nails. Then, fit them in the box and attach them with wood glue and nails through the box and into each end of the X piece. To build the top, we used our Kreg Jig to create 1.5” pocket holes down one side of 4 of our 5 longer boards, and also at both ends of all 5 boards. Attach the 5 boards to each other first with 2.5“ pocket hole screws, and then attach the breadboards with 2.5” pocket hole screws. Create the shelf assembly of the table the same way! Attach the three boards to each other using 2.5” pocket hole screws. Don’t forget to add the pocket holes on each end to attach this to the leg assembly later. Now attach the horizontal runner that will go between each leg assembly. This is attached using wood glue and 2.5” pocket hole screws into each assembly. You will also attach the bottom shelf to both sides on this part. Make sure your pocket holes are facing down. Final step is attaching the top! Line the top up evenly on the base. Set the top face down on the ground and attach the base through the horizintal runner using wood glue and 2.5” wood screws.. You can also add a few 2” nails through the top and into the bases. I stained the table using Varathane Briarsmoke stain and I mixed it with half natural stain to lighten it up just a bit. I did a 50/50 mix. Just stir it really good. You can find it HERE on Amazon. I added the decorative hardware last. I found that at Hobby Lobby. This is a link to one of their corner pieces. And here she is all finished! I found the glass vases HERE! I found the flower stems HERE! The tutorial for the sign can be found HERE! The tutorial for the corner corbel can be found HERE! I love this & your videos. It’s really helped my confidence level (as a total beginner.) I’ve built your floating shelves (LOVE them) and the cake stand you did (I’m adding dowels in the middle for the connecting parts so I can take it apart & store it almost flat & not worry about Velcro) I’m wondering if you’d do a console that matches this? I really like Ana White’s x console but liked your legs better! I too want to know… what kind of wood did you use? Pine, fir or….? I’m never sure what’s best to grab. Do you find furniture grade? Pine is so soft & limited in my area for dimensions. Fir is readily available but I’m not sure how the end product comes out. Thanks! I built one of these without the Xs (because I have a 2 year old that would’ve been climbing up all day long). It came out awesome. I wish so could share a pic. Thanks for sharing the plans! What is that black bit you have on your quiet strike? Are you going to have plans for matching end tables? We did our own… just use same dimensions for the X sides… then choose how wide you want the top. Can’t share pics here for some reason. LOVE THIS!!!! Does anyone know where the basket underneath the table came from? I’d like to get something similar. Thank you! What is the final height and width. I love the color and just want to verify how you got it. You mixed 50% natural premium Varathane (none fast drying) with 50% Varathane Briarsmoke (fast drying). Is this correct? I need some help with the x’s! I can not get the diagnol cuts right. What color stain did you use on yours? How do I get the material and cut sheet? It’s on the free printable plans. There is a link that says click here, towards the top of the page. Thanks you guys, love the channel! Help! I feel like I’m going crazy, what angle is your mitre saw set at to do the cross pieces?! I just wasted 3 2×4’s trying to get them to look right. I did the trick with pencil and everything but they look terrible and don’t line up! Hi Lorie! You can use an angle finder to get the correct angles on the mitered X’s…. Measure each one after you mark them with a pencil because you will have two different readings with slight variances in each of them. I use a digital angle finder from HD, Husky brand & it works great! Best of luck to you!! What kind of wood do you use and from where? Been going to home depot and using the framing lumber which splinters like crazy no matter how I cut it. Any suggestions?? Could you sexualize your comments anymore? So bad! Great job, ladies. I’m saving this to build later. Thanks for all your help and ideas. I love, love, love the table! I’m not sure what I’m doing wrong but whenever I have a piece where I need to attach boards together for a table top with 2.5 inch pocket holes and 1.5 inch ph scewsI have a problem with the screws coming through the wood and showing up on the top. Help please. You may need to check your settings on your jig. Make sure it corresponds with the thickness of the wood you are using.